Let’s question our age old concept of education, what is its role and what is it supposed to do? It’s of course different from literacy, which is the ability to read and write. 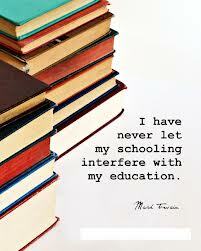 Education might be imparted or not be in classroom environment. The receiver has to be motivated. The giver can take any form (could be a person, nature or even a machine). Education should enable the person to think clearly and to question ideas. If you know the art of asking the right questions, you are half-learned anyway. It should free a soul enough to listen to others’ viewpoint, and critically think through it without being offended, even if it is totally the opposite of what s/he thinks and believes.